Remove the left wheel spacer. 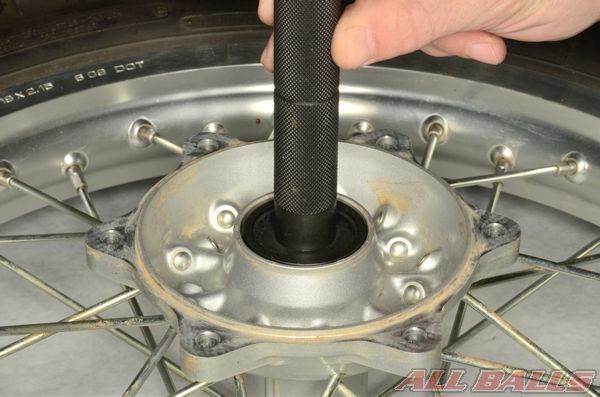 Remove the right wheel spacer. 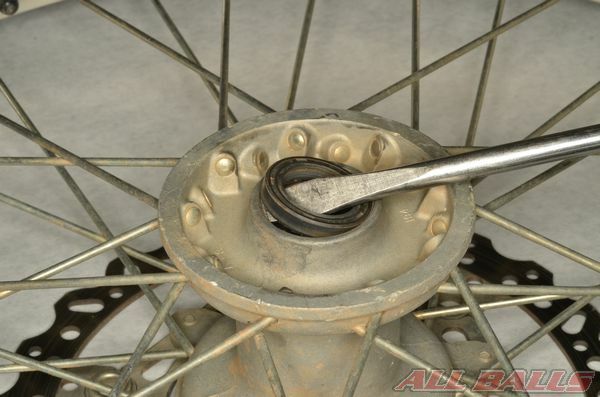 Remove the brake disc to avoid damaging it while replacing the wheel bearings. Remove the dust seals with a seal pick or flat blade screwdriver. 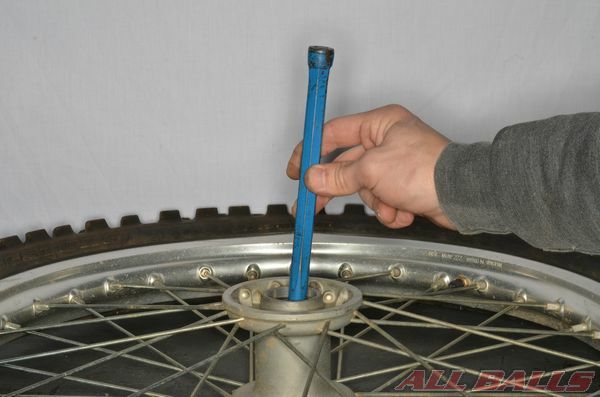 Take care to avoid damaging the hub. 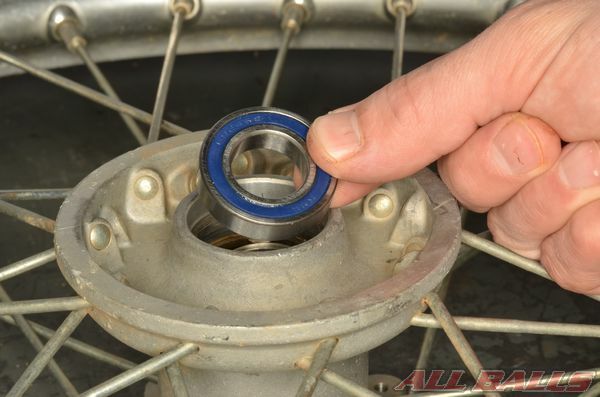 Check the bearings for rough action or looseness by turning them with your finger. If they feel loose or resist turning, replace them with new bearings. Check for any snap rings or bearing retainers. Remove the snap ring from its groove with snap ring pliers. 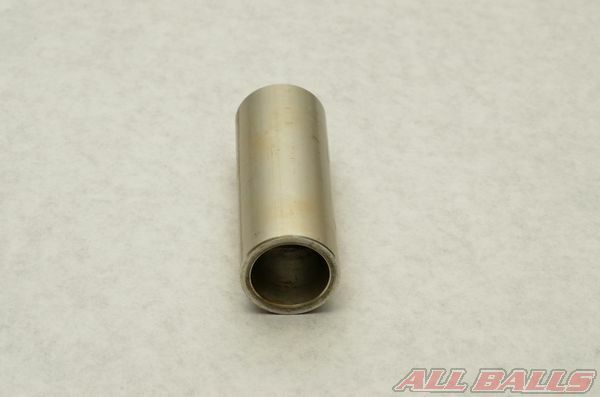 Honda CRFs use a a threaded bearing retainer that calls for a special wrench for removal. A punch can be used for removal, but take care to avoid damaging the hub. The special wrench will be needed to properly torque the retainer on installation. 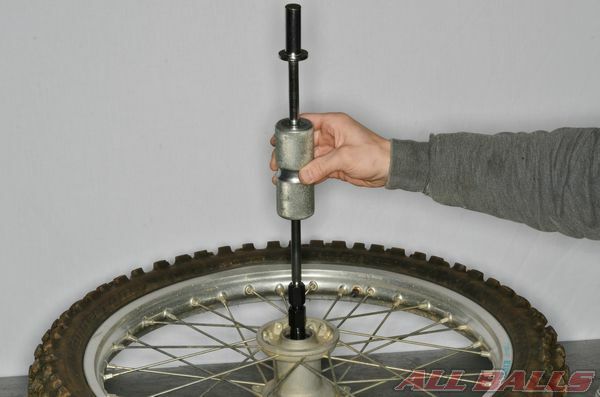 Use a suitable bearing puller to remove the bearings. If a bearing puller is not available, a long punch with a good edge and hammer can be used to remove the bearings. Insert the punch into the wheel and catch the edge of the bearing on the other side. 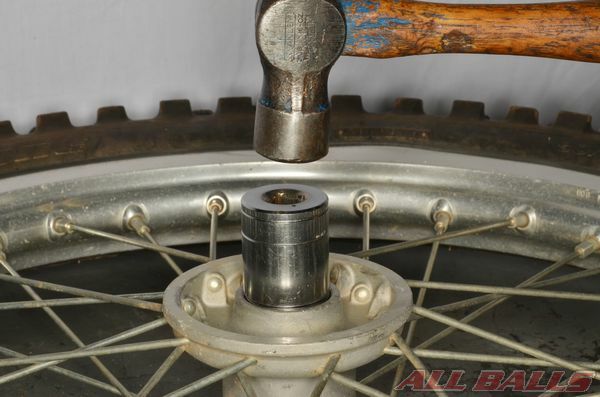 Using a hammer, hit the punch and work around the entire circumference of the bearing. 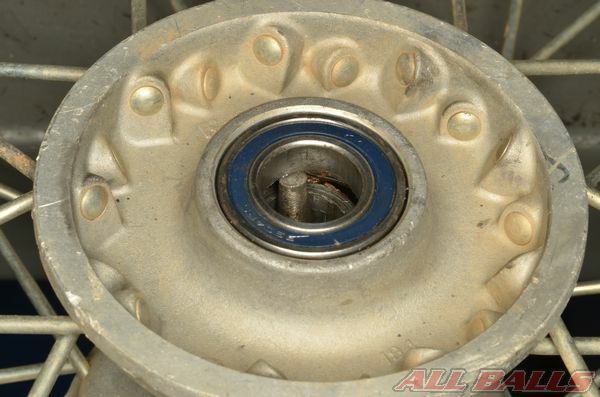 The bearing will eventually be pushed out of the wheel hub. 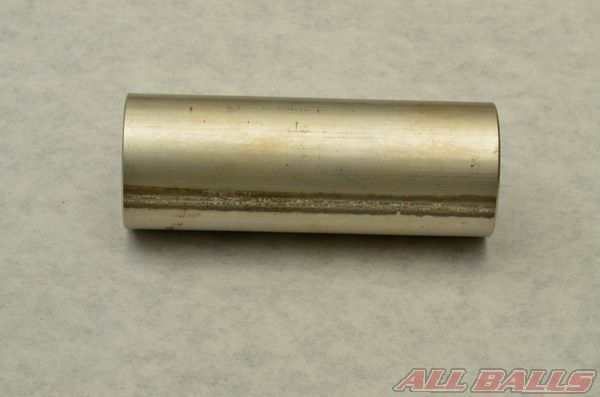 Note: The bearings will be damaged during the removal process and should not be reused. The hammer blows transmit their impact through the balls causing small flat spots, which will cause the bearing to quickly fail if reused. 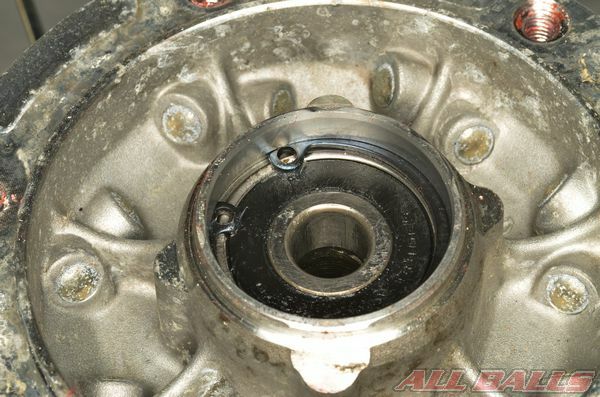 With one bearing removed, pull the inner spacer out of the hub. 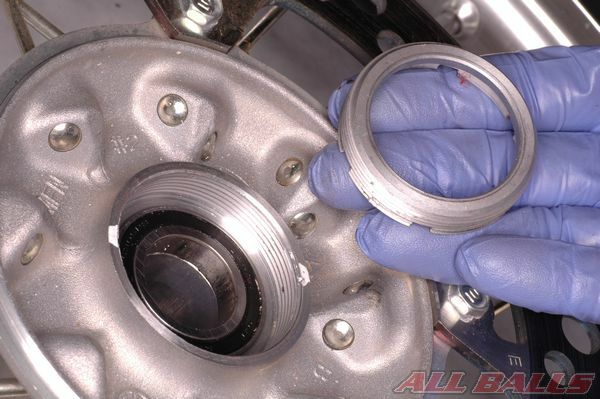 The second bearing can be removed using a punch, a long socket or other suitable driver. Inspect the condition of the inner spacer. 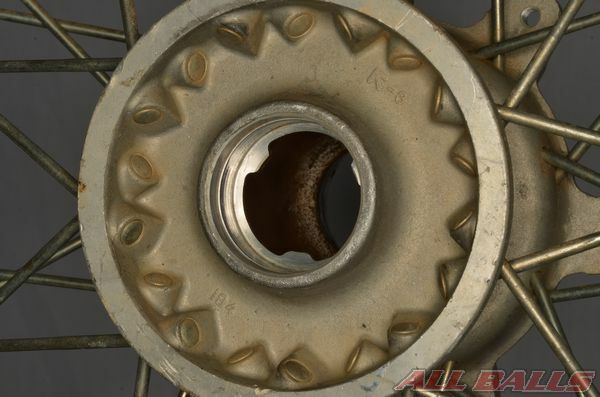 Check the bore to make certain it is clean and the axle easily passes through it. Check each end for wear and burrs. The edges must be square to seat properly against the new bearings. If the old bearings failed it is a good idea to confirm that the center spacer has not been damaged. Make sure the inner space is the same length or slightly longer than the bearing stops in the hub or carrier. 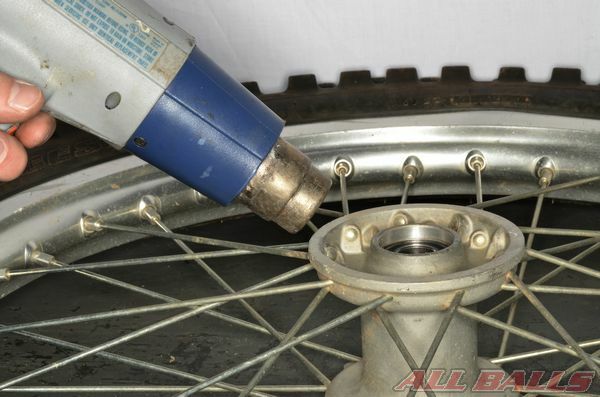 Clean and inspect the wheel hub. Remove any dirt and corrosion. Make certain not to remove metal. This will adversely affect bearing fit. 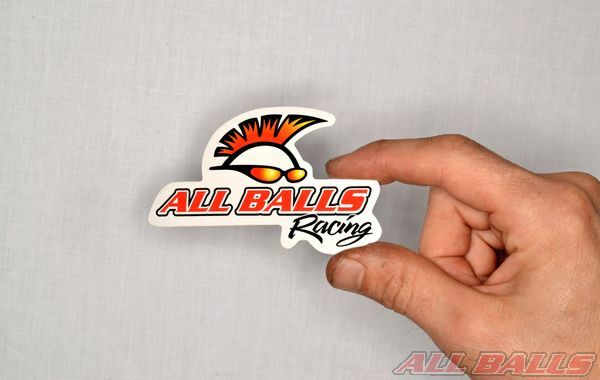 Select the appropriate wheel bearing and seal kit from ALL BALLS Racing. 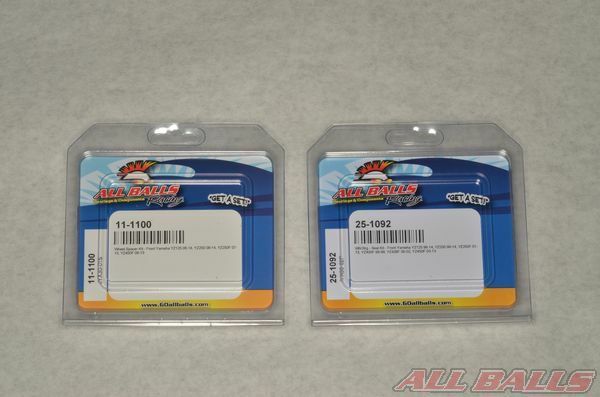 All Balls also has wheel spacer replacement kits. 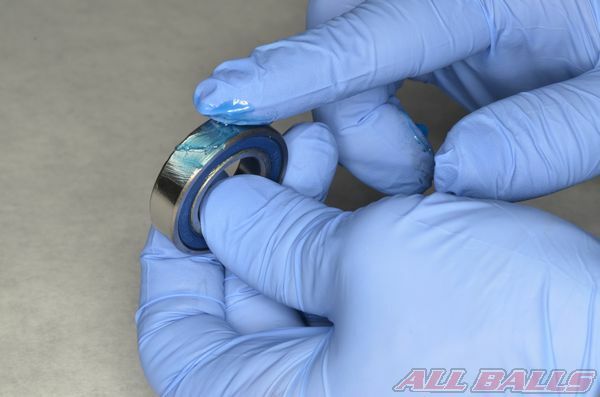 To make the bearings fit easier, place the new bearings in the freezer for about an hour before installing them. Apply a light coat of grease to the outer bearing race to aid installation. 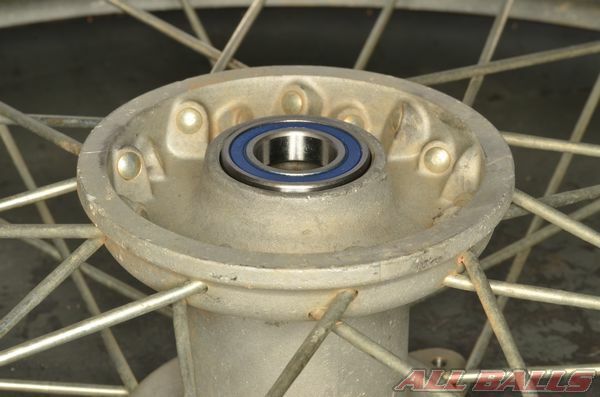 Heating the wheel hub will cause the hub to expand slightly and will make bearing installation easier. Set the first bearing in place with the manufactures markings facing out. 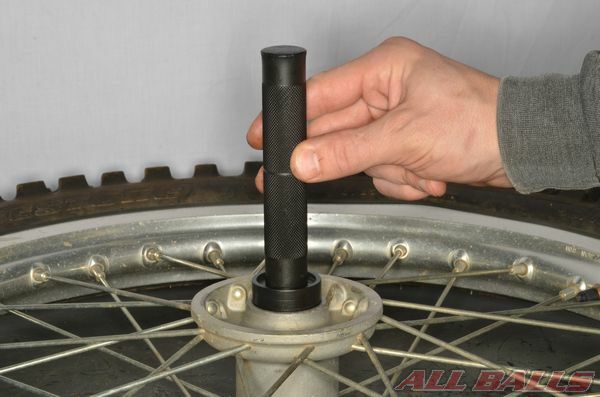 If the hub has a snap ring or some other type of bearing retainer, always install that side bearing first. Apply pressure ONLY to the outer race of the bearing. 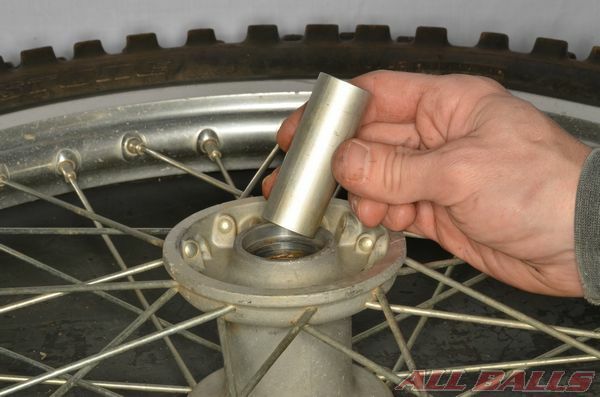 Apply pressure evenly so the bearing remains square to the wheel hub. Use a suitable bearing driver that has the same outside diameter as the bearing. Drive the first bearing into place so that is fully seated in the hub. If a special bearing driver tool is not an option, a socket with the same outside diameter as the bearing can be used as a substitute. Flip the wheel over. Install the inner spacer. 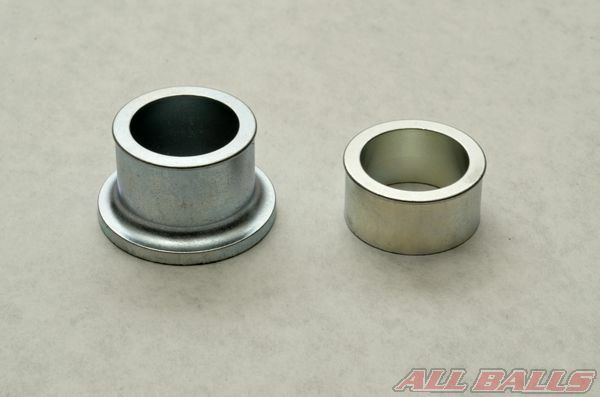 Install the second bearing with a suitable driver with the same outside diameter as the bearing. 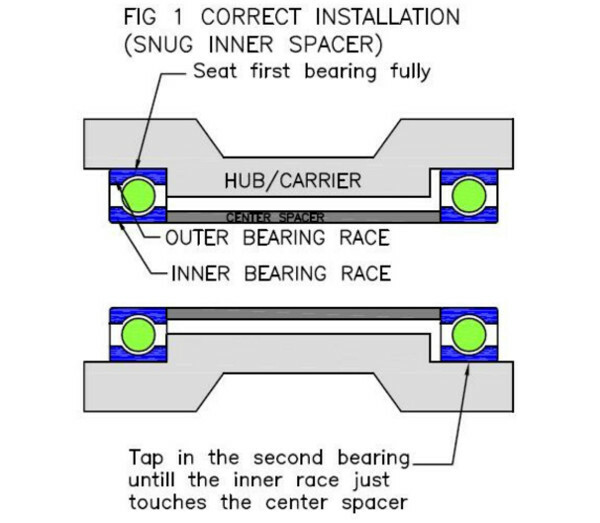 Drive the second bearing in until the inner race just touches the center spacer (See fig 1). 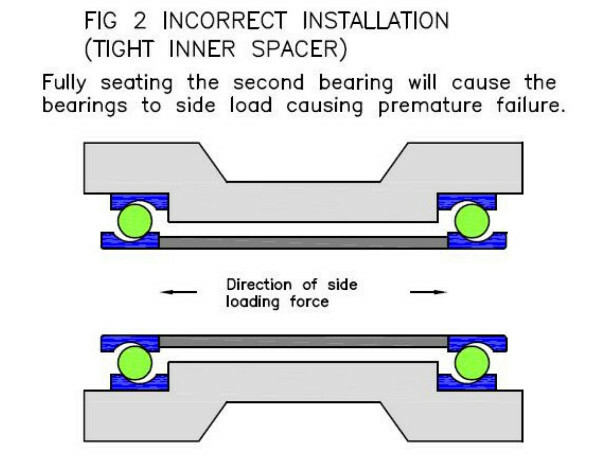 Fully seating the second bearing may cause both bearings to become side loaded causing premature failure (See fig 2). 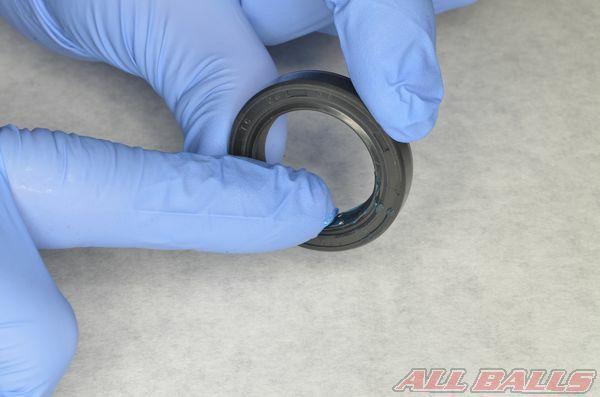 If the center spacer is loose after the second bearing is installed, this may be a sign that the center spacer is too short and needs to be replaced or the second bearing needs to be taped in further. 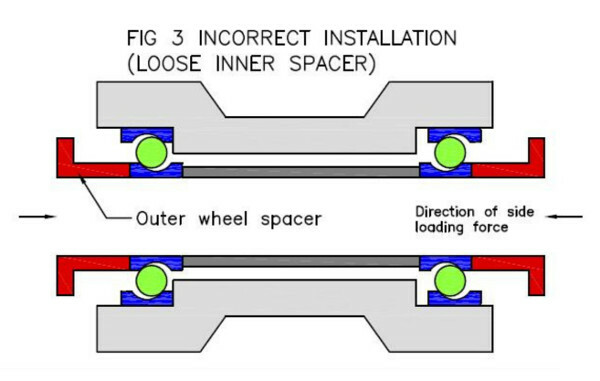 A lose or worn center spacer can cause the bearing to be side loaded in the opposite direction after the axle is torqued down (See fig 3). 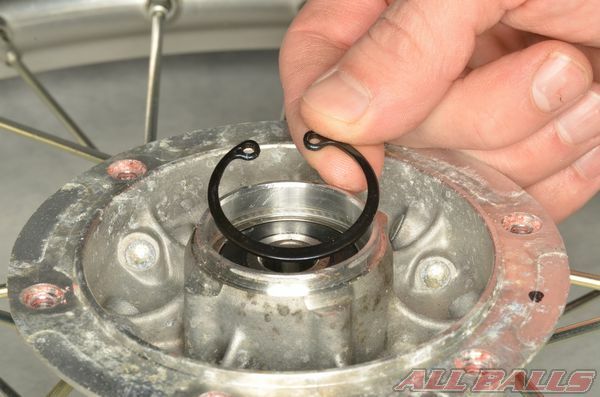 Install the snap rings or bearing retainers as required. The installed bearings should rotate as smoothly and easily as it did before it was installed. Apply grease to the lips of the new dust seals. Install the seals with the markings facing out. Press in the seals with a suitable driver with the same outside diameter as the seal. Drive the seal in so that it is flush with the hub or to a specified depth in the service manual. 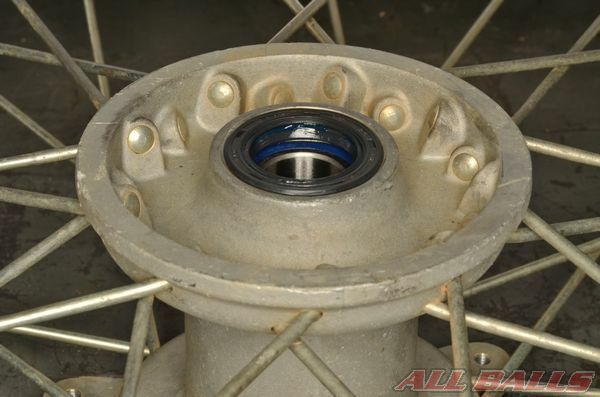 Install the outer wheel spacers to their correct side of the hub. Insert the outer spacers into the dust seals.